Dragon eats faeces in disrespectful display. Dynamo Dresden fans choreographed a tifo showing Hamburger SV mascot Dino Hermann swallowing excrement when the two sides met in 2. Bundesliga on Monday. 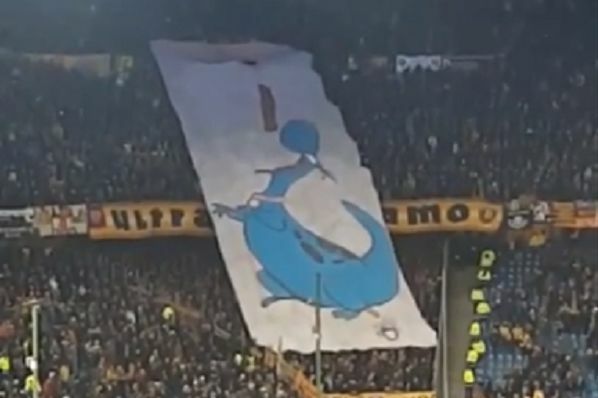 The travelling Dresden supporters at the Volksparkstadion unfurled a banner of the HSV dinosaur with its mouth open underneath a rear end expelling faeces. Some fans on the underside of the display then slid the excrement gradually downwards until it disappeared into Dino’s mouth. It was their first ever league fixture against Hamburg, which seemingly contributed to the carnival atmosphere. In the match itself, Hamburg, nicknamed Der Dino (The Dinosaur), won 1-0 thanks to a late goal from former Tottenham Hotspur midfielder Lewis Holtby.